In a medium bowl whisk together the olive oil, white wine vinegar, lemon juice, lime juice, shallots, Dijon mustard, orange zest, salt, crushed red pepper and chopped basil. Reserve 2 tablespoons of the marinade. Pour the remaining marinade into a large Zip-loc® bag along with the shrimp. Seal and shake to coat. Refrigerate for 4 - 8 hours. Drain shrimp and set aside. For the guacamole salsa, peel avocados and remove the pits. Place in a blender with green onion, garlic, salt, olive oil, the reserved marinade and cream. Puree until smooth. Stir in mango salsa. 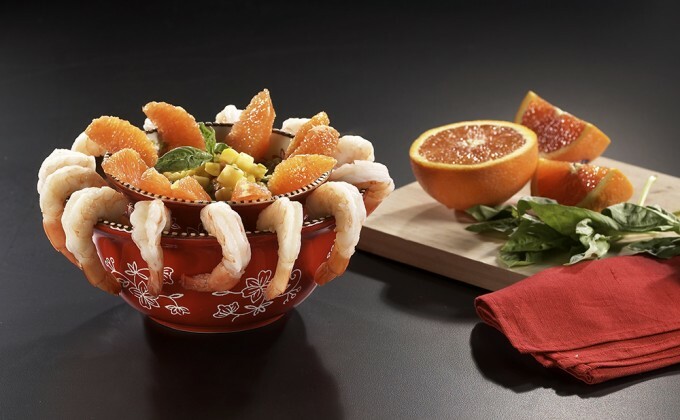 Spoon mixture into top bowl of temp-tations® 3-Piece Lidded Chill & Serve Set and garnish with sectioned oranges. Fill larger bowl of Chill & Serve Set with ice, set smaller bowl inside. Arrange chilled shrimp around edge of larger bowl. Serve immediately and enjoy!